This beautiful new book presents a mouthwatering selection of classic regional recipes. 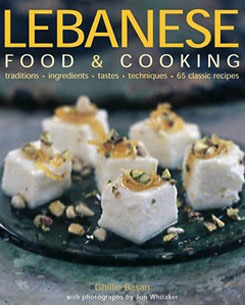 There are world-renowned favourites such as falafel, fattoush, and kibbeh, and also less well known, but no less delicious, recipes such as stuffed apricots with rice, baked red cabbage with quince and walnuts, and baked fish with orange and lime. A Lebanese meal is often completed with little sweets, and here you can learn how to prepare stuffed red dates, quince preserve and Lebanese coffee. With more than 300 beautiful, specially commissioned photographs, this inspiring book captures the essence of Lebanese cooking.